HMD Global already played the nostalgia card last year with the Nokia 3310, so this year it has decided to go with something more novel: enter the Nokia 8 Sirocco, the v2.0 of its high-end smartphone, the Nokia 8. So how does this latest device compare to its predecessor? We put it to the test. Want to know more about the Nokia 8? Read our full review. Although it was announced already back in February 2018 (at the MWC), the Nokia 8 Sirocco only saw the light of day in June - initially, with the hefty price tag of $750. It has since dropped to about $600, but that's still quite a bit of money to fork out given the technical specs of the device (Snapdragon 835) and when you look at other phones that are just as good (or better) and cheaper. Rumors had hinted at a Nokia 9, but ultimately it was the Nokia 8 Sirocco that was revealed. The name will be familiar to fans of the brand since it comes from the Nokia 8800 Sirocco Edition, which in turn gets its name from the strong winds that build up in the Sahara desert when a front of warm, dry air meets the cooler Mediterranean sea air. With the Nokia 8 Sirocco, we saw a lot more emphasis placed on the quality of the phone's finishing touches than on its design. HMD Global learnt from its mistakes on the original Nokia 8 and what results is a stunning and well-polished device . Nokia's latest device thus marks a break with the history of the range with a much more attractive design. Of course, Nokia is still not quite trending when it comes to being fashionable but it comes with a 16:9 aspect ratio screen with ultra thin and curved edges. Like for the Samsung Galaxy S8, the Nokia 8 Sirocco housing is made of two glass plates glued to a metal frame. Both plates are slightly curved and the screen thus stretches along the sides of the device, somewhat reminiscent of Samsung's most recent Galaxy S series. Nokia kept its upper and lower edges to make the phone easier to hold. However, the smartphone's ergonomics leave something to be desired because the device proves itself to be somewhat delicate. And the edges are quite sharp. With this new design, we see a change in the positioning of the fingerprint scanner: it has moved from the front to the back of the device, and is now beneath the dual camera. While awaiting an in-display fingerprint scanner, it's not a bad compromise for such a classy design. Another notable difference is that the mini-jack has disappeared (Nokia provides an adapter in the box). Instead, the Nokia 8 Sirocco has gained IP68 certification which protects it against dust and water. It also has been kitted out with wireless charging thanks to the glass. IP68? IP67? What does it all mean? With a 5.5" screen (compared to 5.3" on the Nokia 8) and 2K resolution (2560 x 1440 pixels), HMD Global has decided to change the display technology in the Nokia 8 Sirocco compared to the original Nokia 8. Goodbye IPS, hello OLED! What this actually means is that the Sirocco will be able to offer more vibrant colors, although these could potentially look less natural than an LCD screen. Black is also much "more black". In practice, the rendering is good and the colors are more or less on par with other OLED displays on other high-end smartphones. Whites, however, tend to be a bit blue and colors can sometimes appear a little cold. In addition to this new screen technology, another good thing about this Nokia is its software interface. The smartphone comes with a stock version of Android 8.1 Oreo with the latest security patch from June 2018. 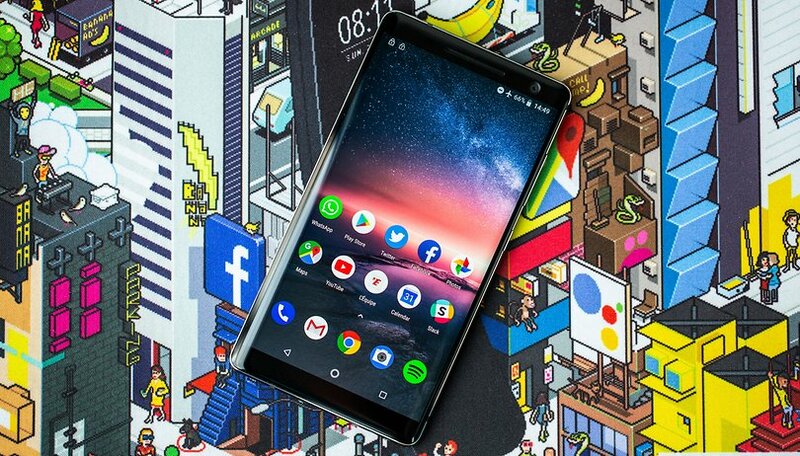 In fact, all new Nokia phones (except the Nokia 1, which has Android Go) that were launched in 2018 joined the Android One program aspectquote>from Google, which is designed to offer the purest version of Android. What this means for you is that all Nokia Android phones will receive the latest updates (including monthly security matches). As for stock Android, you either love it or you hate it. Personally, I love it. This clean version void of any bloatware has vastly improved the fluidity of the system. Apps opened quickly and the phone showed no signs of overheating when I tested them. Despite not having Qualcomm's latest Snapdragon 845 processor, the Nokia 8 Sirocco still comes with a very respectable specs sheet, however it is below what the competition has on offer. aspectquote> The Sirocco has Qualcomm's 835 Snapdragon processor with 6GB of RAM (which was launched in late 2017). It also has 128GB of internal UFS (Ultra Fast Storage) 2.1 memory but unfortunately, there is no slot for a microSD card. From our tests, the Nokia 8 Sirocco is not equal to other flagships launched in 2018. But while the smartphone can't compete with the best on the market, neither does it embarass itself. The user experience is beautifully fluid. You'll never run out of power for games, even the most demanding of games. However, despite its glass design, the device tends to heat up when really pushed to its limits. Like almost all flagships launched in 2018, the Nokia 8 Sirocco is without the 3.5 mm mini-jack. Although Nokia had the good idea of giving us a Type-C to mini-jack USB adapter, this only works with headphones and earbuds with a 4-pin mini-jack connector (usually ones with microphone). For conventional wired headphones and 3-pin headphones, the audio quality is distinctly worse. Pity. As for the only loudspeaker at the bottom of the smartphone, it has proven itself to be of "good quality". Without stereo sound, the Nokia 8 Sirocco performs rather well with remarkable amount of power and a fairly natural sound. You might sometimes notice a lack of bass on some songs, but nothing astounding. No, the Nokia 8 Sirocco does not yet offer a circular 5-lensed camera like on the Lumia 1020. This novelty should appear on the Nokia 10, in all likelihood. Meanwhile, Nokia's partnership with Zeiss has been renewed and the Nokia 8 Sirocco offers a dual 12MP camera with a wide-angle lens and 13MP with a 2x zoom. The 5 megapixel camera at the front also has a wide-angle lens (84 degrees). A trademark Nokia feature, the "bothie", is still very much available - this allows you to simultaneously take a picture with both the front and rear cameras. Nokia also had the good idea to update its photo app with a new manual mode. The app is very complete and deserves its own review, with its numerous options and features, which will improve the general quality of your photos. As for photo quality, let's take a minute to talk about this: the results are very good in well-lit conditions. The Nokia 8 Sirocco takes pretty shots with good contrasts and colors that are pretty close to reality. You only begin to see some noise when there is a lack of light. Worse still, at night, the Nokia 8 Sirocco copes even less well than the Nokia 7 Plus! The front sensor isn't particularly impressive either. The images are sufficient for the majority of uses but nothing to write home about. In terms of video, the Nokia 8 Sirocco can shoot in 4K or Full-HD. The only thing missing is that the stabilization is rather average as there is no OIS stabilization. The battery of the Nokia 8 was not disappointing. The Nokia 8 Sirocco was pretty much the same. The smartphone has a 3260 mAh battery. Enough to get through the day without having to stop by the charging dock under normal use. If you push the phone a little through playing games or videos, you'll probably need to charge it before the day is up. In the PC Mark battery test, the Nokia 8 Sirocco obtained a result exceeding 9 hours, which is more or less equal to its predecessor. If 2017 was the year of Nokia's return to the world of telephony, 2018 is the year of its confirmation. Unlike its predecessor, the Nokia 8 Sirocco is more worthy of HMD Global's ambitions. The Finnish manufacturer has done well with this phone, with a more attractive design proving to be pleasant to use and leaving a rather more positive note overall. In terms of its OLED screen, the Android One interface and its battery life, it's a really decent phone. However, when it comes to price, we were entitled to expect a little more from the Nokia 8 Sirocco, starting with a better camera, a slightly more updated specs sheet and certainly better audio quality. This article was amended on July 16, 2018 to contain our full review. Any comments written while our previous review was up have not been deleted. Look forward to installing the Windows 10 on ARM OS on a phone like this. Will probably wait for the 10 to come out, be a better candidate for the OS. Never going to use Android; ever. Or crapple. Hi Pierre, interesting review, thank you. But think that you have confused your readers by stating that the Nokia 8 Sirocco is on steroids and comes with the newest Qualcomm Snapdragon 845, when sadly it is in fact the Snapdragon 835. I firmly believe HMD have made a grave mistake in utilising last years processor, they would have a true flagship competitor had they equipped their newest high end phone with the SD845, and I personally would have had one on pre-order as it ticks every box apart from the SoC, shame! Nice work catching that Richard. We've amended the article. I think you're right in that as impressive as the Nokia 8 Sirocco is, without the current-gen chip it's not going to be able to compete in the same class as the big brand flagships this year. HMD should have opted for a completely new Nokia 9, same specs, 18:9 display with the SD845. Personally hoping that the rumoured Nokia 10 will address this sooner rather than later, but by that time it could well be up against the OnePlus 6 and the Google Pixel 3 which will be stiff competition indeed! But if the rumoured 5 lens camera system is on-board which provides Pixel 2 quality photos, Google could be in for a fight, can't wait to see what Nokia still has to offer for 2018. It appears OEM'S don't learn from one another. Using the 835 processer is a huge mistake. That's what hurt the sales of the LG g6 using the 821 instead of the 835 processer. No matter how well it performs consumer's when paying big bucks will go with the 845 processer. And the new Nokia doesn't come cheap! I gotta be honest, I don't think Nokia will run into similar issues as LG. The brand Nokia and the phones are perceived differently than LG phones. Nokia puts a lot of focus on user experience, and most updates. I am convinced that that will work better, as the phone does actually offer something that other phones don't: updates! Bastian, the Nokia Sirocco costs as much as the s9+. Plus it has project treble for updates. And the 845 processer. I would not spend that kind of money on last yrs 835 processer. I realize Samsung has first dibbs on the 845. Nokia should have waited. How is the Sirocco gonna compete with the 2018 releases, it won't! Yes it is a good phone but not for my money! At least in Europe, the S9+ costs 200 Euros more than the Nokia phone. I do agree that in terms of hardware the Galaxy S9+ has more to offer, obviously. But that's exactly what I'm talking about, Nokia is going a different route. They are not even trying to directly compete with Samsung, and that makes a whole lot of sense. This is not Nokia's best offering for 2018. Simply put it's running last years processor the 835. Will consumer's notice? Absolutely, I'd rather take a shot with the 7plus especially the price range. This will have to same problems like the LGg6, using last years processor isn't gonna cut it! all you people talk aboat is the 835 and not 845. what aboat the the phone in use and look and feel. s9 is maybe 2 or 3 sekund faster in 10 min. use, whats the hurry.